treatment in which an increased concentration of oxygen is made available for breathing, through a nasal catheter, tent, chamber, or mask. 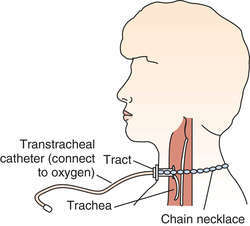 any procedure in which oxygen is administered to a patient to relieve hypoxia. method Of the many methods for providing oxygen therapy, the one selected depends on the condition of the patient and the cause of hypoxia. Low or moderate amounts of oxygen may be supplied to postoperative patients by a nasal catheter or cannula. A precise amount of oxygen may be delivered by a Venturi mask. Patients with chronic obstructive lung disease must receive low-flow oxygen to prevent the elimination of their stimulus to breathe (low O2 levels). If hypoxia is the result of impaired cardiac function, a high concentration of oxygen may be delivered by a nonrebreathing or partial rebreathing mask. Humidity and drugs in aerosol form may be given with oxygen through a variety of devices, such as an aerosol face mask, Croupette, or T-piece. interventions Thorough and careful observation of the patient's need for oxygen and response to therapy are important. The concentration of oxygen received by the patient must not be assumed by the rate and concentration at which it is delivered; a person whose respirations are rapid and shallow receives more oxygen than does a person breathing deeply and slowly. Many clinical situations require frequent laboratory evaluations of the levels of arterial blood gases or oxygen saturation levels by means of pulse oximetry. Thorough knowledge of the equipment used and the condition being treated enables the nurse to care safely and effectively for the patient who requires oxygen. outcome criteria Oxygen therapy may be used in the treatment of any condition that results in hypoxia. Although there are several kinds of hypoxia, all result in hypoxemia. Oxygen administration may relieve hypotension, cardiac arrhythmias, tachypnea, headache, disorientation, nausea, and agitation characteristic of hypoxia, as well as restore the ability of the cells of the body to carry on normal metabolic function. a nursing intervention from the Nursing Interventions Classification (NIC) defined as administration of oxygen and monitoring of its effectiveness. See also Nursing Interventions Classification. A medically supervised use of pure oxygen, hydrogen peroxide, or ozone to treat a wide range of health problems. Inhalation of high concentrations of oxygen, esp. at pressures of more than one atmosphere, may produce deleterious effects such as irritation of the respiratory tract, reduced vital capacity, and, sometimes, neurological symptoms. Serious eye defects may result if premature infants are exposed to a high concentration of oxygen as part of their therapy. Because oxygen provides a perfect environment for combustion, it should not be used in the presence of oil, lighted cigarettes or open flames, or where there is the possibility of electrical or spark hazards. 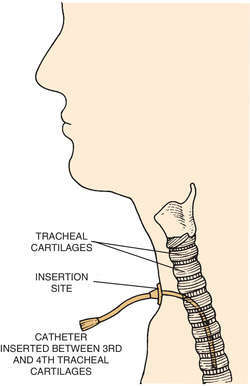 The delivery of oxygen via a small plastic cannula inserted directly into the trachea through a small surgical opening in the cricothyroid membrane of the neck. Treatment in which the inhaled air contains a much higher concentration of oxygen than normal atmospheric air. Oxygen therapy is appropriate for conditions in which the oxygen concentration in the blood is reduced for any reason. It is also used to improve the oxygen supply to the tissues even when the haemoglobin of the blood is fully saturated. It achieves this by increasing the amount of oxygen dissolved in the blood plasma. Oxygen is given by light plastic masks or by soft tubes fitting comfortably into the nostrils (NASAL CANNULAE). the treatment of disease; therapeutics. See also treatment. the treatment of humans, usually for mental or psychological illness, which incorporates familiarization with a companion or pleasure animal. Called also pet-facilitated or pet-assisted therapy. See also animal facilitated therapy. the use of drugs to render the blood sufficiently incoagulable to discourage thrombosis. treatment with agents, such as x-rays, corticosteroids and cytotoxic chemicals, which suppress the immune response to antigen(s); used in organ transplantation, autoimmune disease, allergy, multiple myeloma, etc. given before the primary treatment, such as chemotherapy, hormone therapy, radiation therapy. the administration of supplemental oxygen to relieve hypoxemia and prevent damage to the tissue cells as a result of oxygen lack (hypoxia). See also oxygen therapy. use of physical agents and methods in rehabilitation and restoration of normal bodily function after illness or injury; it includes massage and manipulation, therapeutic exercises, hydrotherapy, and various forms of energy (electrotherapy, actinotherapy and ultrasound). See also physical therapist. treatment of disease by means of ionizing radiation. See also radiotherapy. treatment to replace deficient formation or loss of body products by administration of the natural body products or synthetic substitutes. serotherapy; treatment of disease by injection of serum from immune animals. the administration of a hormone to compensate for glandular deficiency. Financial margins in wound care clinics can be tight, and the need to remain profitable has at times resulted in patients being treated inappropriately with hyperbaric oxygen therapy (Adv Skin Wound Care. Despite advances in the understanding of physiological and clinical aspects of oxygen, as a therapeutic agent it is one of the most ill-prescribed/Inadequately practiced item in clinical settings 4,5 and therefore the patients requiring oxygen therapy do not get optimal benefits. The global hyperbaric oxygen therapy devices market segmentation is based on product types (monoplace HBOT devices, multiplace HBOT devices, topical HBOT devices), and its applications (air or gas embolism, decompression sickness, infection treatment, wound healing, etc. Hyperbaric Oxygen Therapy Devices Market USD 2.8 Billion by 2020 - iHealthcareAnalyst, Inc. In Australia the major cause of chronic hypoxia is COPD, but is a feature of many other cardio-respiratory diseases Oxygen is prescribed according to the adult domiciliary oxygen therapy position statement of the TSANZ. These patients may be benefited by nocturnal oxygen therapy. The American Association of Respiratory Care published guidelines in 2002 regarding supplemental oxygen therapy for adults in acute care facilities, yet these guidelines fail to address titration with activity, nor do they address the variety of populations that are treated by physical therapists. Hyperbaric oxygen therapy was first used in the 1930s to treat deep-sea divers suffering from the bends. In another study (9), nocturnal hypoxia was found to be common in patients admitted in the medical wards and nocturnal oxygen therapy was needed for them. Hyperbaric oxygen therapy can result in arterial oxygen tension in the range of 1000-1600 mmHg and tissue oxygen tension close to 400 mmHg. A large randomized, controlled trial (2011) at a medical school in central China evaluated the effect of hyperbaric oxygen therapy on post-surgical brain edema in 232 patients. Now a Birmingham hospital has become the first in the UK to use oxygen therapy to help heal patients suffering from a crippling skin condition. BEAUTY students have raised pounds 500 for a Golcar girl to have vital oxygen therapy.